This article is about the town in England. For other uses, see Exmouth (disambiguation). Exmouth /ˈɛksməθ/ is a port town, civil parish and seaside resort, sited on the east bank of the mouth of the River Exe and 11 miles (18 km) southeast of Exeter. Byzantine coins with the mark of Anastasius I, dating back to c. 498–518, were retrieved from the beach in 1970. More recent human occupation of Exmouth Point can be traced back to the 11th century, when it was known as Lydwicnaesse, "the point of the Bretons". The town appears on the century Peutinger Map one of only 15 British towns and the second most westerly town overall to appear on that Roman Era map. The two ecclesiastical parishes, Littleham and Withycombe Raleigh, that make up the town of Exmouth today can be traced to pre-Saxon times. The name of the town derives from its location at the mouth of the River Exe estuary, which ultimately comes from an ancient Celtic word for fish. In 1240 an area known as Pratteshuthe (Pratt’s landing place) was sold to the mayor and citizens of Exeter. This was the site of the estuary’s ferry dock and over time the name evolved first into Pratteshide, then Mona Island. The original site is marked by a seating area outside the Glenorchy United Reformed Church close to the Magnolia Shopping Centre. For some centuries, commercial trade through the port was limited in part by the shallow waters on the approach to the quay, but mainly by the power of Exeter, which owned the dock and controlled all estuary traffic. The roads in and out of the area were in a poor state and only occasionally repaired by the parishes through which they ran. A more permanent dock was built in 1825, replacing a series of apparently seasonal docks first noted on maps from 1576 as "The Docke". New docks designed by Eugenius Birch were opened in 1868, and a short line connected them to the railway goods yard. The area adjacent to the docks once housed a thriving community of some 125 chalets built on the shoreline. These have been replaced by a residential marina complex known as Exmouth Quay. Human habitation was restricted by the harsh exposed position on the estuary – civilisation took a hold in a greater and more permanent way in the more comfortable outer lying rural areas. The town began to develop in the 13th century. Morin Uppehille owned the land, granting part of it to John the Miller who in turn built a windmill, and earned his living on the exposed point, aided by the prevailing south-west winds. The windmill, the ferry dock and a small settlement of farms began to develop into Exmouth. Sir Walter Raleigh (born 1544) sailed on many of his voyages from Exmouth Harbour. In the mid 17th century the area suffered from the ravages of "Turkish pirates" (actually Algerian rovers), who raided the Devon and Cornwall coastlines, attacking shipping and attempting to capture sailors and villagers for sale as slaves in North Africa. The town established itself during the 18th century and is regarded as the oldest holiday resort in Devon. Visitors prevented from visiting Europe by the revolutionary turmoil in France were attracted by the views and medicinal salt waters which were then fashionable. Exmouth was renowned as a destination for the wealthy to recover their health. Notable visitors in this time included Lady Byron and her daughter Ada Lovelace. Exmouth was also the residence of Lady Nelson, the estranged wife of Lord Nelson. She is buried in Littleham Churchyard. High class tourism remained steady for a number of years. This changed when the first railway line into Exmouth was built in 1861, bringing with it mass tourism. It is from this "golden age" for Exmouth that the present form of the town can be traced. Exmouth has a wide range of architecture, ranging from small cob cottages in parts of the town that were once villages and are now incorporated into it, such as Withycombe, to the Georgian, Victorian and Edwardian town houses. The seafront has a traditional promenade. High above the promenade is the Beacon terrace, which first became fashionable in Georgian times. The majority of buildings in Exmouth were constructed during the Victorian era with the arrival of the railway. The area to the west of Exeter Road is land that was reclaimed by the railway, Exeter Road originally being part of the seafront. Some houses near to the station in Littleham were constructed for the workers on the railway. In addition to its substantial summer tourist trade, Exmouth serves as a regional centre for leisure industries, particularly water sports such as sailing, kite sailing, paddleboarding, jet-skiing, and wind-surfing, and outdoor activities such as bird-watching, cycling and walking. The Exe Estuary is a Site of Special Scientific Interest (SSSI) and is noted in particular for its wading and migrating birds. A large part of the estuary lies within a nature reserve. Exmouth marks the western end of the Jurassic Coast World Heritage Site, which stretches eastwards along the coast to Poole, in Dorset; the South West Coast Path allows for walking along this coast. The town is also at the western end of the East Devon Way path that leads to Lyme Regis. Exmouth is a commuter town for Exeter, to which it has good public transport links by train and bus. The town has 8 primary schools and one secondary school. In 2013, Exmouth Community College (formerly Exmouth School) had 2,615 pupils, aged 11 to 18. Rolle College was opened in 1946 and later became the Exmouth campus of the University of Plymouth. In 2008 the University of Plymouth decided to close the College. East Devon MP Hugo Swire discussed the College's closure in Parliament. The town is defined by the sea and river frontages (each about a mile long), and stretches around 2.5 miles (4 km) inland, along a north-easterly axis. The docks lie at the western corner of this rectangle, where the river passes through a narrow passage into the sea, the mouth of the estuary being nearly closed by Dawlish Warren on the opposite shore of the river. Dawlish Warren is a natural sand spit and is home to rare wildlife and plants, part of which is a nature reserve and restricted access. The sea frontage forms a sandy two mile long beach; at its eastern end, the town is limited by the cliffs of the High Land of Orcombe, a National Trust-owned open space which rises to a peak at Orcombe Point. Geologically, the low hill known as "The Beacon", in the centre of the present town, is formed of breccias that are an outcrop of a similar formation on the west side of the Exe estuary. The rising land on which the town has grown is formed of New Red Sandstone. This solid land is surrounded by mudflats and sandspits, some of which have been stabilised and now form part of the land on which the town is built, and some of which remain as tidal features in the estuary and off the coast. The outflow from the river flows eastwards, parallel to the beach for some distance, limited by sandbanks that are exposed at low tide. Many of the buildings on the reclaimed land are fitted with pumps to extract water from their basements during high tide. Administratively Exmouth lies within the East Devon district, along with neighbouring coastal towns east of the Exe. It has its own town council, presided over by a mayor elected from amongst the councillors. There are five wards each electing five town councillors thus 25 town councillors in all. Councillors are volunteers for which they receive no remuneration. The town clerk is the council's senior paid officer with eight part-time staff. The town supports Exmouth Town Team, Tourism Team and Arts Forum and employs a Town Management Officer with the role of supporting the economy of the town working with businesses and promoting the town. The total population of the five wards mentioned is 34,442 meaning that one or more must spread outside the town's boundary. The 16-sided 18th century house called A La Ronde, now in the ownership of the National Trust, lies on the northern outskirts of the town. At the eastern end of Exmouth is the Barn, a late 19th century house in Arts and Crafts style. Exmouth Lifeboat Station is situated at the eastern end of the seafront near Maer Road. From here the Royal National Lifeboat Institution operates a Shannon Class All Weather Lifeboat (ALB) R and J Welburn (previously a Mersey-class All Weather Lifeboat (ALB) named Margaret Jean) and D-class (IB1) Inshore Lifeboat (ILB) named George Bearman. The latter was replaced in 2017 by the D-Class Inshore Lifeboat George Bearman II. The National Coastwatch Institution also maintains a Watch House in Exmouth, where qualified volunteer watch keepers keep an eye out for sailors and walkers. Exmouth's first lifeboat was provided in 1803. A boathouse was built near Passage House but was washed away in a storm in 1814. The Royal National Lifeboat Institution revived the lifeboat station in 1858. A new boathouse was built near the beach, although the lifeboat had to be taken across the road before it could be launched. This boathouse was demolished and a new one built on the same site in 1903 to accommodate a larger lifeboat. From 1961 the lifeboat was kept afloat in the river near the entrance to Exmouth Docks. A boarding boat was kept on a davit that was lowered into the water to ferry the crew to the lifeboat. The old lifeboat station by the beach was retained as a fund-raising display centre and, from 1966, was the base for an inshore lifeboat. The building used by crews at the docks was demolished in 1996 and replaced by temporary portable buildings. On 21 November 2009 both lifeboats were transferred to a new lifeboat station on Queen's Drive at the eastern end of the beach. Within the building is a sign from the now-demolished Volunteer Inn once run by Will Carder. On Christmas Day 1956 he was swept overboard and drowned during a mission on the Maria Noble to save the crew of the Dutch ship MV Minerva 4 miles south east of Orcombe Point. It is regarded as the worst tragedy in the history of Exmouth RNLI. The old boathouse was retained as a base for the RNLI lifeguards until 2014, when it became the headquarters of the Exmouth Rowing Club. As of November 2012[update], £3 million has been spent on the regeneration of the Strand, which has seen the removal of much of the grass, flower beds and many of the trees. The new features include an additional seating area and bicycle storage; the area has also been completely pedestrianised. The Strand was partially open for Remembrance Sunday 2010 with the war memorial area complete. The Church [Holy Trinity] is a chapel of ease under the parish church of Littleham, and was erected by the late Lord Rolle, at the cost of £13,000 in 1824-25. It is a handsome structure, in the perpendicular style, standing on the Beacon hill, and having a tower 104 feet high, containing a clock and one bell. The whole length of the building is 140 feet, and its breadth 84. The interior is handsomely fitted up, and has sittings for 1,500 hearers. It has a fine toned organ, and over the altar table is a fine canopy of Beer stone, in the florid Gothic style, ornamented with crockets, pinnacles, & c. The curacy has a small endowment, given by the noble founder and is annexed to the vicarage of Littleham. Until the erection of this church, Exmouth was without an episcopal place of worship; for though a small ancient chapel, dedicated to the Holy Trinity, was standing in 1412, all traces of it disappeared some centuries ago. Exmouth Town F.C. is the leading football team in the town, and play in the South West Peninsula League. Exmouth has two rugby union teams, Exmouth RFC and Withycombe RFC. East Devon Eagles rugby league team were based in Exmouth and played until 2011 in the South West Division of the Rugby League Conference. Exmouth is also home to the Polesanders Beach Rugby Club who were established in 2014. Devon County Cricket Club play their Minor Counties Championship matches at the Maer Ground. Exmouth also has a large indoor leisure centre. Exmouth railway station is the terminus of the Avocet Line to Exeter St David's station although the trains run through to Paignton and Barnstaple alternately through the day. A cycleway has been built alongside the railway as far as Topsham. The Exmouth to Starcross Ferry is a passenger ferry that operates during the summer months across the Exe estuary to Starcross, where the pumping station for Brunel's Atmospheric Railway can be seen. There have been three railway stations at Exmouth. The line first reached Exmouth from Exeter in 1861. In the first five days 10,000 people travelled on the line and property prices increased overnight. By the 1880s commuter traffic to Exeter was considerable. In 1903 a link to Budleigh Salterton was opened the line going eastward over a viaduct which went from Exeter Road to Park Road where it entered a cutting continuing onto Littleham Cross where there was also a station (now a private residence), and from there to Budleigh Salterton, there turning north to rejoin the main London and South Western Railway line. Exmouth Station was rebuilt in 1926. When the line to Budleigh was lifted the viaduct was left in place for many years, with its final destruction in the late 1980s. Housing marks its position now. The route of the line continued behind Phear Park, which was once the grounds of a large house belonging to the Phear family, used during the Second World War to station US soldiers. Shortly after the war the house was burnt down and left derelict; eventually it too was demolished, and its grounds were given to the town by the Phear family to become a park. The old railway line behind Phear Park was just left as a bare trackbed for many years. At its far end there was a deep cutting to Littleham, which was filled in when the line was closed. The trackbed has now been tarmacked and now forms an off-road cycle way and footpath from Exmouth to Knowle, close to Budleigh Salterton. The latest station was built in 1981 beside the bus station and is a single platform station. It also has a pay and display car park for rail users. Stagecoach South West operate several, frequent bus services in and around the town, including the 57 Stagecoach Gold service to Brixington in one direction, and Lympstone, Topsham, and Exeter in the other direction. This service runs every 15 minutes. Another popular Stagecoach service is the 95 summer service to Sandy Bay Holiday Park. This is usually operated by an open top bus, and runs every hour. Francis Danby (16 November 1793 – 9 February 1861) Irish born painter of the Romantic era. ^ "Exmouth Update" (PDF). 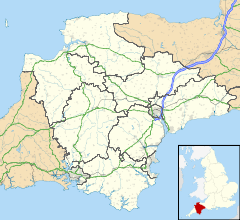 [Devon County Council]. 2011. Retrieved 29 March 2012. ^ History Of Exmouth, Devon. "History Of Exmouth, Devon". Exmouthonline.com. Archived from the original on 10 March 2012. Retrieved 23 February 2012. ^ Mitchell, Vic; Smith, Keith (1992). Branch Lines to Exmouth. Midhurst: Middleton Press. ISBN 1-873793-00-6. ^ "Illustrated London News 1861". Iln.org.uk. Retrieved 23 February 2012. ^ England. "EduBase - Exmouth Community College". Education.gov.uk. Retrieved 29 May 2013. ^ "Exmouth's Rolle College – latest news". Exmouth People. Archived from the original on 15 July 2014. Retrieved 29 May 2013. ^ . "Rolle College, Exmouth: 15 Jul 2008: Westminster Hall debates". TheyWorkForYou. Retrieved 29 May 2013. ^ a b Leach, Nicholas (2009). Devon's Lifeboat Heritage. Chacewater: Twelveheads Press. pp. 6–9. ISBN 978-0-906294-72-7. ^ Salsbury, Alan (2010). A History of the Exmouth Lifeboats. Wellington, Somerset: Halsgrove. pp. 132–146. ISBN 978-0-85704-073-2. ^ "Strand set for 3 million regeneration plan". The Devon Week. 2 September 2009. Retrieved 8 February 2013. ^ "Exmouth's Remembrance Sunday Parade a "total disaster"". Exmouth People. Archived from the original on 14 March 2012. Retrieved 23 February 2012. ^ "Exmouth Sports Centre Home". LED Leisure. Retrieved 23 February 2012. ^ a b "History of the Avocet Line". Avocet Line Rail Users Group. Archived from the original on 8 December 2013. Retrieved 8 February 2013. ^ "History of Phear Park Bowling Club, including references to the old house". Phear Park Bowling Club. Archived from the original on 1 August 2013. Retrieved 8 February 2013. ^ Palmer, Stephen. "Phear Park in Exmouth". step-10. Retrieved 8 February 2013. ^ "Exmouth to Budleigh Salterton Cycle Route". Retrieved 8 February 2013. ^ "Writer". Alex Wade. 26 June 2005. Retrieved 23 February 2012. ^ Hurley, Graham. "Interview with Lynne Hackles in Writing Magazine". Graham Hurley. Retrieved 18 August 2012. ^ "John Churchill Marlborough, famous people from Exmouth". Information-britain.co.uk. 31 January 2007. Retrieved 23 February 2012. ^ Powell, Neil (26 August 1999). "Obituary: Patricia Beer". The Independent. London. ^ "Classical Album Chart 27/9/2014". Officialcharts.com. 2014. Wikimedia Commons has media related to Exmouth, Devon. Wikisource has the text of the 1911 Encyclopædia Britannica article Exmouth.